All athletes dream of winning an Olympic gold medal. Which sportsman or woman hasn’t imagined themselves standing on the podium proudly wearing their medal, the national anthem playing, the tears and their pride at what must be the crowning moment of their career? which is priceless to the winner and the nation. But what are the medals actually made of? Are they made of real gold, silver or bronze and what is their history? In the very beginning – in the days of the ancient Greeks, only the winner was awarded for an event and there were no prizes for coming second. The winner was crowned with an olive wreath made from leaves taken from a sacred olive tree near the temple of Zeus on mount Olympia. The idea was that men should compete in the games for honour rather than financial gain. It was an unusual idea even at the time and Aristophanes in Plautus an ancient Greek comedy said that this was because the God Zeus was poor. The proof he said was that if Zeus the founder of the Olympic Games had been rich he would give the winners gold rather than olive branches. The Ancient Olympics were staged, as now once every four years. The first games were held in 776 BC but as Roman power increased in Greece so the games declined. They ended at sometime between 393 AD and 426AD following the destruction of Greek temples. Although the idea of a new Olympic Games was aired in the 1700s and 1800s in both Britain and France, the first modern games held under the auspices of the IOC (international Olympic committee) did not take place until 1896 in Athens. Olympic Gold medals were not awarded at these games. Instead, winners received a silver medal and an olive branch and runners up got a bronze medal and laurel branch. In the second games at Paris in 1900, the idea of medals was abandoned completely and most winners received trophies and cups. The custom of awarding gold, silver and bronze medals for the first three places dates back to the 1904 Olympics in the USA and the winners of the earlier two Olympics were awarded their medals retrospectively. However, the custom of awarding solid gold medals for first place did not last long. The last series of Olympic medals to be made of solid gold were awarded at the 1912 Olympic Games in Sweden. Today the winning medals are strictly regulated. Minting the medals is always the responsibility of the host country who are free to come up with the design but have to adhere to standards. All Olympic medals must be at least 3mm thick and 60mm in diameter and have the event details printed on the medal. 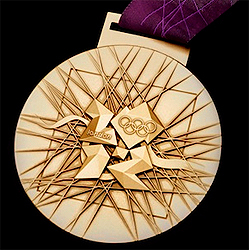 The gold medals must be made from silver with a purity value of at least 92.5% and plated with a minimum 6gms of gold. It is worth around $495 or £320. The silver medals have the same composition as the gold medals but are left unplated. The value is around $296 or £190. The bronze medal is mostly copper with tin and zinc added and is valued around $3 or just under £2.00. As well as medals, every competing athlete receives a diploma and the names of all medal winners are inscribed upon a wall of honour in the main host stadium. With the cost of the 2012 London Olympics apparently spiralling out of control, providing solid gold medals for the 300 events may have been felt to be a step too far.